Following the release of their self-titled new studio album in 2016 the band supported this release with extensive touring of the United States, Canada, UK and Europe which included festivals like Bang Your Head, Bloodstock Open Air, Sweden Rock, Rock Hard, Stormcrusher, Pyscho-Las Vegas, Leyendes Del Rock, Metal Days, Hard Rock Hell. The band continue to be creative and spent much of 2017 writing and recording songs for their next album to be released later this year. DIAMOND HEAD were a major influence on bands like METALLICA and MEGADETH with METALLICA covering four DIAMOND HEAD songs including the classic "Am I Evil?" Which has sold around 10,000,000 copies and is available on eighteen different METALLICA releases. Plus "Helpless", "The Prince" and "It's Electric". 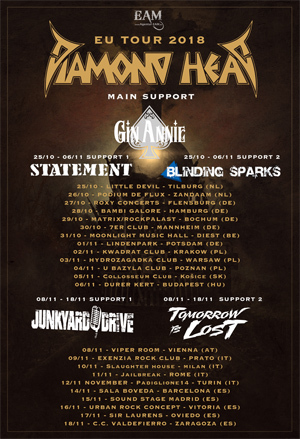 Over the years DIAMOND HEAD have toured with AC/DC, BLACK SABBATH, MEGADETH, METALLICA, THIN LIZZY and most recently SAXON in February 2018.